It was a Hindu wedding, a Vedic Brahmin marriage ceremony. Games and play featured throughout the two days in a general sense, and in very specific elements too. There were times when free play just happened (of free will, by choice, self generated) and when people were instructed to play as part of the ceremony. note: we were given booklets explaining the ceremony-anything in italics with inverted commas comes from the booklet. Day one-the engagement, which featured rituals “known collectively under the name vratham”. The outdoor area of our house, (essentially a car port) was beautifully transformed into a celebratory space, decorating it with bright coloured material and flowers. Chairs and tables were decorated and of course food was prepared. The day started with Henna. Everyone was invited to have henna applied and the henna artists instead on bringing their own playlist to really liven up the morning! 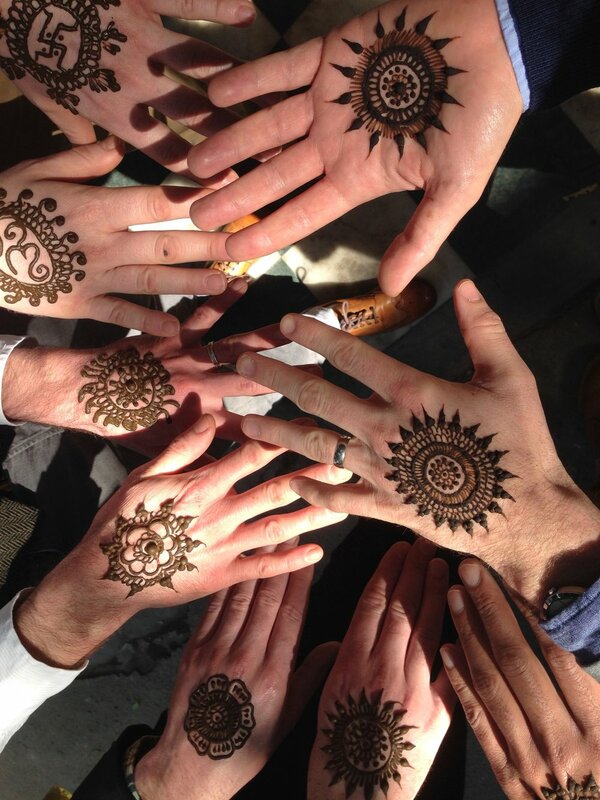 Henna was a great way to bring strangers together because as one has to let the henna dry, groups of people must stand with arms extended in odd positions for most of the morning. The shared silliness of the physicality and the collective avoidance of brushing against anything created a lot of fun and laughter. The father of the grooms impulsive ‘hands in pockets’ was a classic example. Drummers soon arrived and the dancing began. Children retreated due to the volume, but they formed their own dance circle at a distance, and proceeded to tear and throw masses of flower petals, creating a maelstrom of blossom and naughty-ness. Bottled water is a big feature of Delhi, as tap water is undrinkable and I loved how the mass of tiny bottles became play apparatus. All manner of throwing and tossing games were played, versions of cricket, bowling, catch, juggling. Skill was found in the amount of water left in bottles, in spin, hight and distance. Throughout the afternoon rites were performed and family members had their parts to play. The main players were instructed where to stand, what to do, what the rules were and we as onlookers took in the uniting of families, communities and our two loved ones. Day two-the wedding or the Muhurtham took place at a temple across town. Rituals are of course carried through from distant times and although we live our lives differently, we continue the actions in a ceremony. This means we are often acting out stories, playing at being the characters of our ancestors. This gave the shape to much of the days games. The groom was “equipped with an umbrella, a walking stick, a palm leaf and a pair of footwear….ready to start on a trip to a foreign location…the city of Benares..a reputed centre of learning and dwelling place of many learned men”. The groom has two options-pursue higher levels of learning or get married. The brides family then persuade him to get married and to their bride. At this point, the groom must make out as if his mind is not yet made up try to make a run for it, several times while the brides family contain him. Bride and groom are life onto shoulders by friends and attempt throw garlands over each other. The couple are then placed on a swing-to signify the ups and owns of married life and rituals carried on around them. One featured rice balls being thrown over shoulders, often almost hitting onlookers. During all of this, was my favourite game of the wedding. I had come across it when researching wedding celebrations for Just So festival last year, but had no idea the stakes were so high! The brides sisters, or female friends will try to steal the grooms shoes. If successful, the groom must buy back his shies before he can leave. It doesn’t matter if the shoes cost 99p-he can’t be married until he pays for them, and the price can go into hundreds of pounds! We knew about the game in advance, so were ready (or so we thought). As soon as Groom’s shoes were off, I put them on my feet. Oh and did the ‘sisters’ notice! Across the crowd eyes could be seen flashing around, down to me feet and knowing glances exchanged. We upped stakes by separating shoes, handing one to another guest. Everywhere we went, eyes watched us and whispers followed. The game was going well, but I felt it was a little skewed to our side, so I entrusted my shoe to a friend and walked barefoot across the temple, just to confuse the ‘sisters’. Ah, but how my confidence did undo me. The shoe was passed to the grooms mother-who was not warned of the stakes and quick as a flash, the sisters had it. A friend of the bride, from York no less, had been recruited as a double agent by the sisters! She had been staying with the family for a week. How silly of us to trust her! She simply walked up to mother and brother of groom, asked for the shoes and they gave them. Foiled! We managed to negotiate down to £100 in the end, and the brother paid, fessing up to his folly. Gosh-it was a brilliant game! I’m sure you’ll see versions of it in future Mufti Games missions! Later, we came back together for ‘Nalangu’-a playful evening of indoor games. Essentially this section was a way of gamifying the rituals. Historically the couple may have been linked at a very young age, the games got the children used to the idea of ritual. The games kept the couple entertained and as they may also be strangers, they would break down barriers and allow the couple to get to know each other through play. Games at Nalangu included pretending to cook and groom each other, rolling and grabbing a coconut, decorating the bride with flowers, bride and groom singing to each other and the brilliant ‘smashing of poppadoms’ over each others heads! Although these were very prescribed games, and were played under instruction from an elder, they were fun and celebratory and could break down barriers to allow a life of playfulness together. The evening I got talking to Indian guests about the ceremony, about ‘hinduism’ and about language. I know that Mufti was an Urdu word and meant amongst other things ‘legal scholar’ but I had heard that it also related to a Hindi word related to play. One definition of ‘play’ is ‘a physical or mental leisure activity that is undertaken purely for enjoyment or amusement and has no other objective’. Happily that evening I was informed that in Hindi, ‘Muft’ simply means ‘free’.